For a trilogy I never cared much about, I surprisingly enjoyed this film. And its not that the story is groundbreakingly good or something...its the production design that I appreciate. 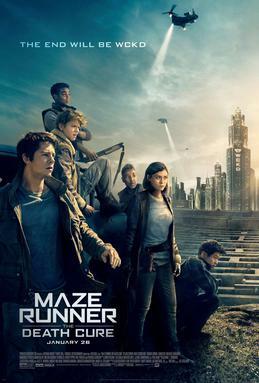 The action sequences were not bad...and the rest of the film are just what you'd expect from a Maze Runner film. But from the first film on, something has constantly improved, and that's the production design. While I am usually an advocate of 'story first' when it comes to movies, I do appreciate these visual details - which is why I go to movies and not read books. There is a certain pleasure in being able to see a dystopian world with different settings like the messy, war-torn outskirts versus the beautiful technological marvel inside the city. And that is what this film does brilliantly. There seems to be a lot of thought that goes through in capturing all the details and creating the settings and backdrops. And not just that, even the character designs and clothing were excellently done. I have special admiration for that one character played by Walton Goggins - just for how he looks. Now, coming to the story...it's actually not half bad. It works for the series and it is simply what you'd expect from this trilogy. But it works, it's decent. Similarly the characters are still not great (and nor are the performances), but yeah, not bad. It works. The action sequences were pretty fun, helped by the production design as well which makes it so believable and enjoyable. And I think, overall, a pretty decent film for a trilogy that I never much cared for. The characters and story weren't great to begin with, and so they end as such. But the production design of this final film makes it a bit more enjoyable to watch, and I appreciate the effort put into it.